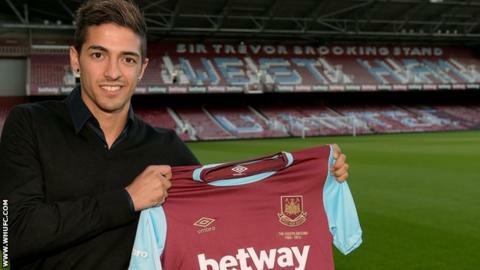 Argentine midfielder Manuel Lanzini has joined West Ham on a season-long loan deal from United Arab Emirates club Al Jazira. The club also have the option to sign the 22-year-old permanently at the end of the season. Former River Plate and Fluminense player Lanzini is nicknamed 'The Jewel'. "This is very emotional because it is one of the best teams I have ever signed for," he told West Ham TV. "It is a very important step for my career and for my future. I am looking forward to what is a new era for me. "I am someone who always gives 100 per cent. I'm an attacking player, I can change the game's tempo and I hope to give my maximum for the fans to appreciate me." Lanzini has been capped four times by Argentina at U20 level and becomes the club's seventh summer signing after Dimitri Payet, Angelo Ogbonna, Pedro Obiang, Carl Jenkinson, Stephen Hendrie and Darren Randolph. Read more on Lewis Hamilton: "I will carry Jules Bianchi with me"